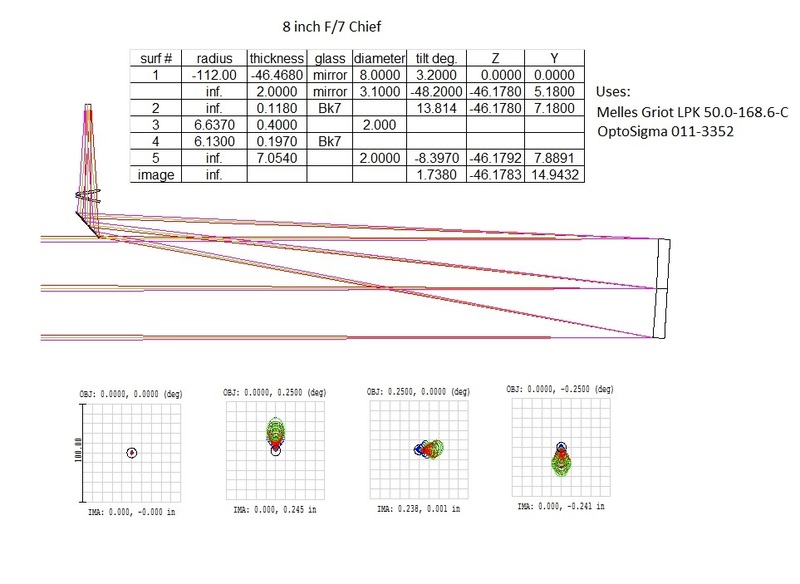 While working on my window scope I discovered this design which uses two correcting lenses and has much better performance that previous corrected Herschelian designs. I initially had planned to make a Maksutov corrected Herschelian using a meniscus corrector with a spherical mirror but that design has a lot of astigmatism in the field. 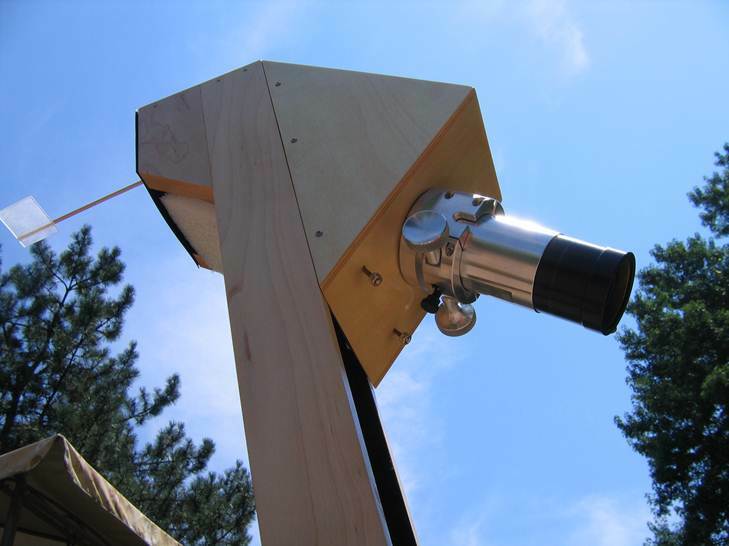 This design resembles one in Jan. 1971 S&T Bob Cox built a CHT (catadioptric Herschelian telescope) designed by Richard Buchroeder. It uses a spherical primary, flint and crown correctors. Off axis the CHT was not any better than the Mak corrector. This design is distinctly different than Buchroeder’sdesign, however, since the primary must be parabolic, not spherical, the correctors must be the same glass type, and the field performance is significantly better. It is the Jones-Herschelian but I call it the Chiefspiegler or just Chief (a play on words from Catadioptric Herschellian schiefspiegler). It is actually pretty simple, just a parabolic mirror and a tilted plano-convex and plano-concave lens (with an optional flat). I also discovered that it could work as fast as F/5.5 making it the fastest and one of the simplest schiefspieglers. Coma is the main aberration in the Chief but it does not come from the correcting lenses. Rather it comes from the parabolic mirror, the same as in a Newtonian. In fact if the design were a Schmidt or other coma free design there would be no coma (I have other more complex Chief design that have no coma). On axis there is no color with the design radii but a small amount of lateral color because the lens radii are not equal (there is none if equal radii lenses are used). Since discovering the Chief design I have built a number of Chiefs. This 12.5 inch Chief was in Sky&Telescope magazine Nov. 2008. I found an F/7 Pyrex mirror on Ebay and decided to turn it into a Chief. 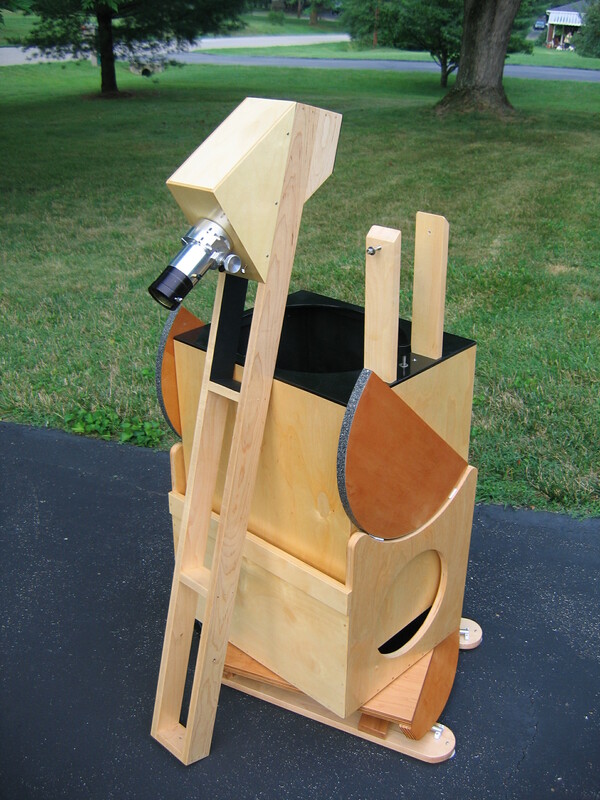 I initially made the OTA with the eyepiece and ladder on top of the mirror box (right). I quickly realized that the eyepiece was not easily reachable and so decided to redo it placing the eyepiece and ladder on the side of the scope. The lens box and ladder unbolt for easy transportation. For alignment I place a frosted screen on the end of the lens box for easy laser alignment (shown below). 1 Using a simple laser I make sure the laser hits the right location on the lenses, the middle of the secondary, then the center of the primary by adjusting the secondary. 2 By adjusting the primary the laser the laser should hit a mark on the alignment screen. I have a line on the screen 6.25 inches from the beam on the X axis. 3 The tilt of the lenses should initially be set using an angle gage as best as possible especially the angle between the lenses. The lens group is adjusted at the eyepiece by going in and out of focus on a star at high power. 4 Astigmatism causes the star image to be football shaped or elliptical along one axis and then switch 90 degrees on the other side of focus. If you have gotten the astigmatism as small as you can by adjusting the lens group but there is some residual astigmatism not orthogonal to the X or Y direction then the primary spot on the alignment screen is adjusted slightly left or right by moving the primary keeping the same distance from the edge of the scope. 5 It is possible that the best star image can be spread into a short spectrum due to the incorrect placement of the lenses relative to each other in the Y direction (up and down decentration). This is axial chromatic dispersion and could possibly compensate for atmospheric dispersion (but I wouldn’t bother). If only slightly off a star will show one side blue and the other side blue. I made provisions in my lens holders to adjust the centration of one lens in Y and the other in X using a plastic tipped set screw. Looking in the eyepiece with no star diagonal if the star is blue on the bottom then you must push the convex lens up or down if the bottom of the star looks red. Axial prismatic dispersion is the result of the convex lens being decentered too high or low. 1. Unobstructed refractor like images The advantages of not having a secondary obstruction is well known to improve the contrast of planetary images and with no spider there are no diffraction spikes. The image is refractor-like but without the color fringes of most refractors or the center field darkening at low power that Newtonians have. Reflector color correction (no purple fringes) You get a diffraction-limited image with no secondary refractor color. Fast speed: Most schiefspieglers have a large F number resulting in very high power with a narrow field of view. The CHief is the fastest, simplest, best performing schiefspiegler and can be as fast as f/5.5 in an 8 inch scope! However fast speed also come with tight tolerances so moderate speeds actually make a better scope. Wide well corrected field Offaxis performance is similar to a Newtonian. CHief correctors contribute very little to the off-axis aberrations. Small Field tilt Field tilt is 3 degrees or less and is better than many otherschiefspieglers and it is possible to have a zero tilt as well. Only two mirrors TheKutter Schiefspiegler also has two mirrors but many schiefspieglers have three or more mirrors or a reversed image. Three or more mirrors lose a lot of light with a standard 90% reflectivity. No custom mirrors. Large aperture Short tubes With a 45 degree fold back the distance from the bottom of the tube to focus is about like an f/5 or f/6 Newtonian meaning large apertures are possible (20 inches so far). BetterbafflingBelieveit or not the light cone is better baffled than a Newtonian and better protected from dew than a Newtonian. More focal distance Newtonians are cramped for focal distance to keep the secondary size small. This is not a problem with the CHief as there is plenty of focus room. I use either a diagonal or an extension tube. 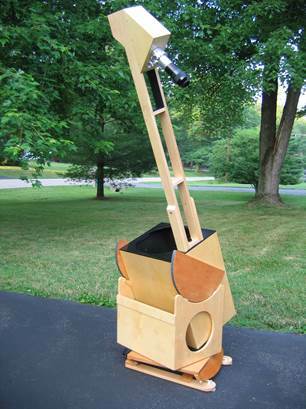 A Dobsonian mount is an advantage for compactness. The CHief idea of using 2 tilted lenses can be applied to many other Newtonian design such as: Schmidt Newtonian, Maksutov Newtonian, Honders, Kutterschiefs, Ritchey-Chretien, Honders/Busack, Houghton and no doubt others. I plan on building 6 or 8 in. OTAs this year for sale. This might be of interest to those wanting to make a CHief. The +/- 500 mm focal length lenses are one of the few commercial lenses that can work for CHief correctors. 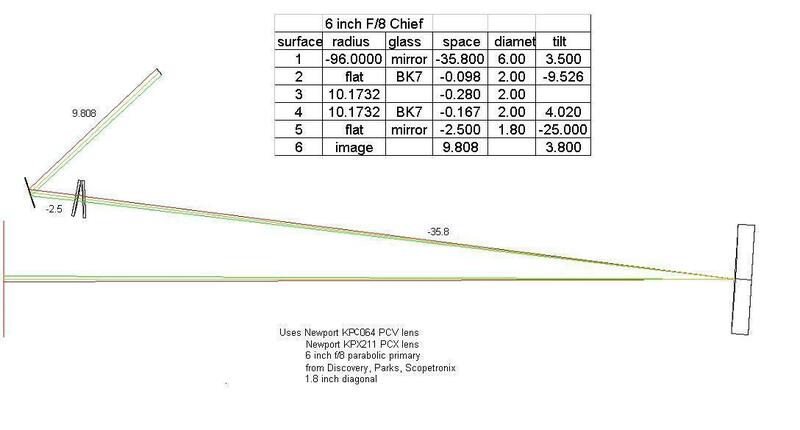 Here are 4 different focal length CHief designs that will allow you to interpolate using Excel for any focal length mirror you might have. Here I have plotted the focal length versus tilt between the lenses and you can do the same for other parameters for the focal length you have. These are for a primary tilt of 3.3 degrees.